Designed for the discerning traveler, Al Khoory Inn Bur Dubai boasts 69 comfortable and modern rooms. The rooms have view of the city and neighborhood. All rooms are exquisitely furnished and elegantly laid out to create an ambience of warmth and coziness in a contemporary setting. Customized carpets in corridors and vibrant artworks add to the cheerful mood of the hotel. 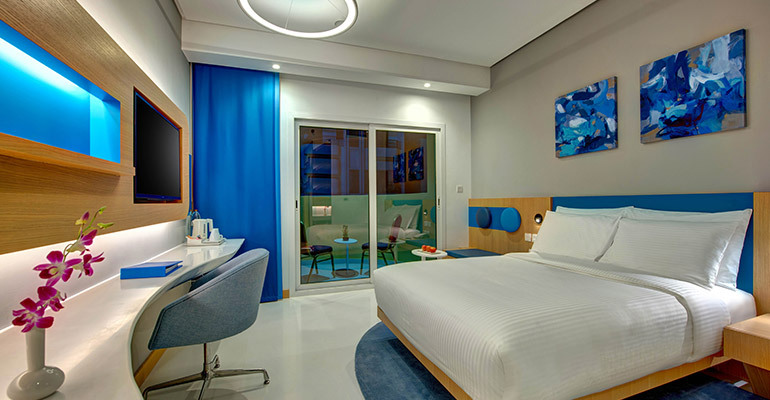 All rooms are equipped with the latest in technology and finest amenities including high definition LCD televisions, Complimentary wireless internet, Electronic safe, Mini fridge, toiletries and all those essentials that make your stay special. 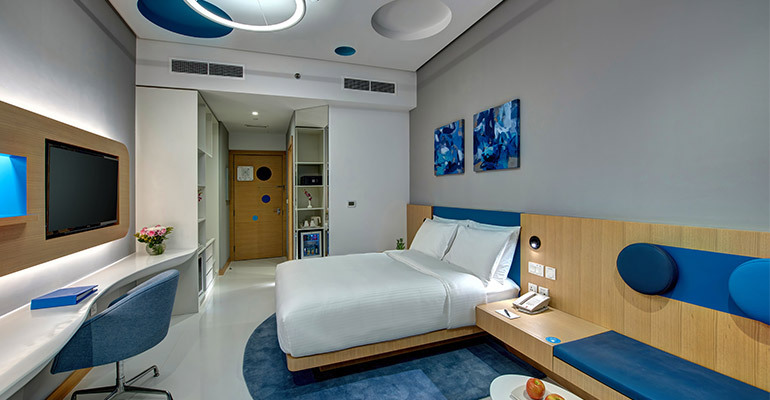 Superior Rooms: 43nos. | Deluxe Rooms: 9nos. | Deluxe Twin Rooms: 15 | Handicapped Rooms: 2nos. Each Superior Room is of 20 sq. mtr. in size and is equipped with state-of-the-art amenities including Comfortable bed, Complimentary wired and wireless internet, 40” LCD television with satellite channels, Hair dryer, Electronic safe, Mini fridge, Climate controlled A/C and Tea and Coffee making facility. Rooms with balcony is also available in some of the floors. The bathrooms are equipped with walk-in showers. 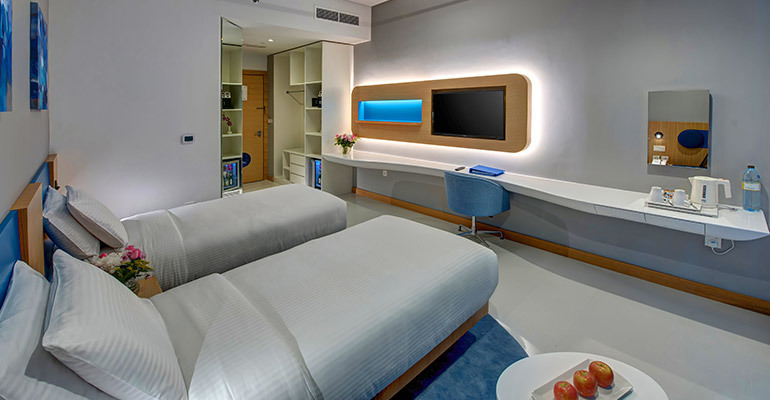 Our Deluxe Rooms range from 24 – 26 sq. mtr. in size. Each room have large windows facing the city and are equipped with the best in amenities including Comfortable bed, Free wired and wireless internet, 40” LCD television with satellite channels, Hair dryer, Electronic safe, Mini fridge, Climate controlled A/C and Tea and Coffee making facility. The bathrooms are equipped with bathtubs or walk-in showers. 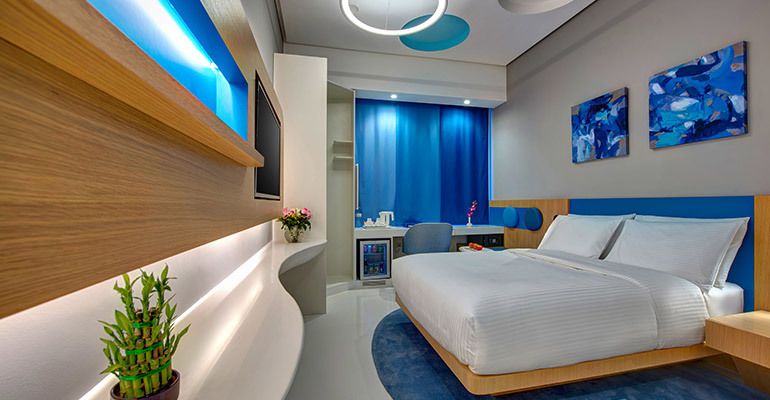 The Deluxe Twin Rooms range from 22 - 25 sq. mtr. Each room is equipped with two individual beds. It also features Complimentary wired and wireless internet, 40” LCD television with satellite channels, Hair dryer, Electronic safe, Mini fridge, Climate controlled A/C and Tea and Coffee making facility. 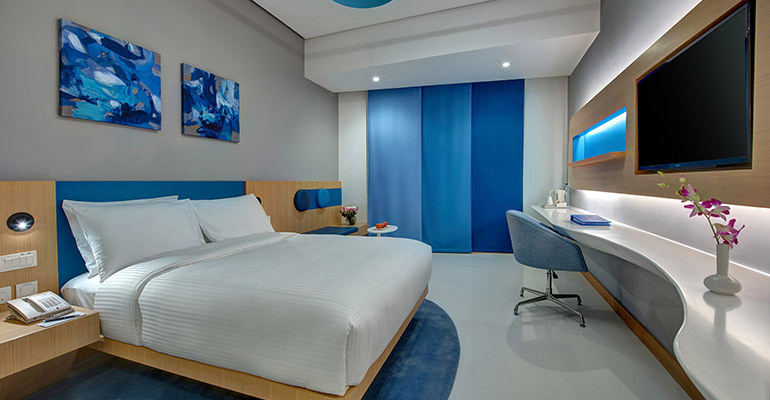 The Deluxe Twin Rooms can be also be interconnected with the Deluxe Rooms for family or friends traveling together. The bathrooms are equipped with bathtubs or walk-in showers. Both Handicapped rooms are available on the first floor of the hotel for ease of access. The rooms and bathrooms are designed to meet the immediate needs of physically challenged guests. Both the rooms feature Complimentary wired and wireless internet, 40” LCD television with satellite channels, Hair dryer, Electronic safe, Mini fridge, Climate controlled A/C and Tea and Coffee making facility.